I learned to knit from my mother when I was seven. Knitting was followed by needlepoint, crocheting, felting, and spinning, all fun and interesting. Learning to weave when I was 35 felt as if I’d come home, as if I’d been a weaver in a previous life. At the loom, I felt connected to weavers everywhere, through space and time. With weaving, my love for textile arts soared. I wanted to see (and feel) it all: scrumptious raw cashmere, hand-spun silk, gorgeous hand-wovens, an amazing range of ethnic textiles—silk scarves from Laos, felted slippers from Turkey. My love leaped to new heights when I joined WARP (Weave a Real Peace), a nonprofit that strives to foster a global network of fiber arts enthusiasts who value the importance of textiles to grassroots economies. Soon I started writing a column, “Textile Techniques from Around the World,” for the WARP newsletter. I had a lot of fun conducting the research, learning about the techniques and the people. An idea to put together a collection of the articles morphed into a full-fledged book, Threads Around the World: From Arabian Weaving to Batik in Zimbabwe—a full-color, hard cover book filled with photographs (many by the wonderful photographer Joe Coca) and 25 updated and expanded articles. It’s just been released (Jan. 28, 2019, Schiffer Press). Between now and Fiberarts International 2019, I’ll share the story of a different textile technique every month in this blog. Some (but not all!) will be about textiles that are included in the book. Berber Flatweave Rugs: They’re my favorite—not for aesthetic reasons, but because of the symbolism imbued in their creation. The Berber of the Atlas Mountains in northwestern Africa are a male dominated society. The women are expected to stay close to home, doing women’s work, which includes weaving. Children also stay close to home, but when the boys become men, they leave the sphere of women’s influence to continue their journey through adult life. 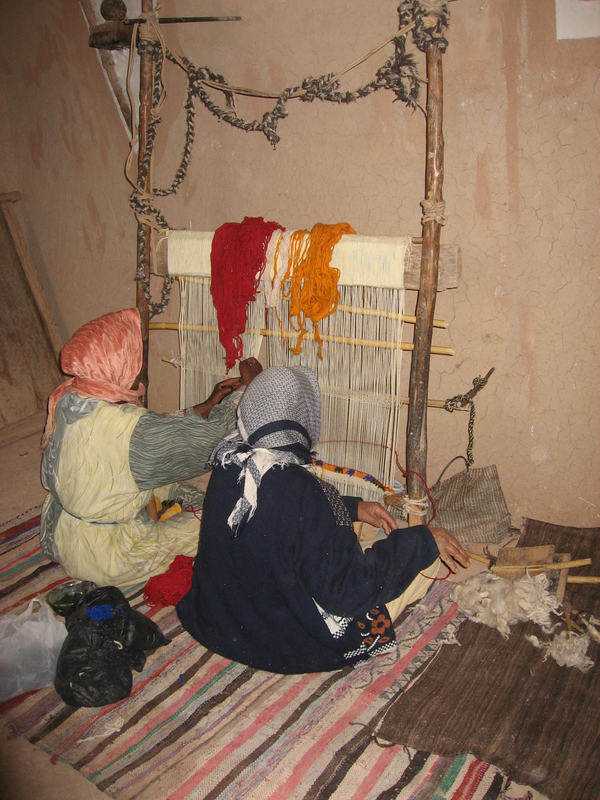 Berber weavers regard weaving as a metaphor of their sons’ life cycle. Prepping the loom represents birth through childhood. Beginning the actual act of weaving signifies the rite of passage from childhood to adulthood. The weaving progresses, as does the son’s journey through adulthood. Finally, when the weaver completes the textile and cuts it off the loom, the textile completes its life cycle and dies, as a man dies after completing his life journey. For the finished textile, the Berber follow the same Islamic rituals of preparing the dead for passage into the afterlife, which for a textile means the journey into its new home. It’s also intriguing that Berber weavers have maintained their textile traditions despite the outside world encroaching on their lives. The Berber and other communities, especially those located in remote areas, have continued to practice their traditions without interruption in part because they have little interaction with modern society. In many such communities, even as the western world intrudes, tempting away their men to earn a living wage, the women, due to societal norms, stay relatively isolated, their way of life largely untouched. Helping these traditions survive—which means helping the (often female) artists and artisans who create them earn a living income from their work—leads to better financial security and living conditions, which in turn leads to better education for their children. We see this frequently: when the women are more successful in marketing and selling their work, they also pursue better education for their children. Better education leads to better chances for peace, locally and globally. Textiles have been integral to humanity from the beginning; they are a fundamental part of the human condition. They don’t just connect us to our past and to each other; they prevent us from losing our humanity. No matter how we define ourselves, we must keep these textile traditions alive.